It was not your typical Friday. Those wonderful long awaited trees arrived today. Michael has all but one in the ground, and we are busily working to get the rest of the yard and our small garden started. Chad, playing contently outside, is called for dinner, just five more minutes, of course, its Ok since I still need to get the garlic bread out of the oven. It is just one of those days. I nearly burned the bread when I called him the second and third times…..
I’ve called the 19 year old Craig and asked him to move his car for the fifth time, for goodness sake that dog has been barking for five minutes, she isn’t gonna hold that ‘present’ for much longer. The Lexie dog just threw up on the rug, Snicker dog pooped on the rug (hey but he tinkled on the paper), and Buttecup is ‘mark marking’ (She doesn’t really bark) for the fifth time in 10 minutes. Again. Some days, the day is just five minutes too long. I’ve asked for the recycling to go out five times to many, (but mom I need five minutes), the garbage is piling up and the laundry is still waiting patiently to be finished. The husband has grumped about something you can’t possibly control and your dear mother is driving you up the wall. I’ve told the kids to brush their teeth for the fifth time, or they’d end up with only five teeth. Must be a day of fives. Maybe I should play the lottery. Then again, I don’t have five bucks in my purse. Sigh. I have decided that life is too short to worry about five minutes. Maybe, just maybe tomorrow will be a ‘want five more minutes’ please day. My mom told me that there would be days like this. I guess she forgot to tell me that they may last for more than one day, one week, one month or even one year. Keep your head up, feed the dog, clean up the living room . For those of us who are believers in Christ, my favorite scripture is Jeremiah 29:11-14, I hope you will dust off your bible and read it. It is simple, I keep in mind that the Lord is the one in charge of my path, he knows the plans he knows the ways, I only seek and find his ways. Just a few thoughts! Have a blessed Friday Evening! Here in Maryland it is a beautiful day! I am enjoying having our beautiful home with windows open. There is something relaxing and comforting about seeing the sheer curtains blowing in the breeze! These are great for gift card holders. 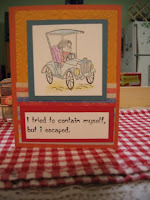 You can view their other great stamps and projects by clicking here. I am making all kinds of goodies to sale. Our community is having a yard sale in May, and since I don’t have much in the way of traditional yard sale stuff, I’ve decided to do some crafty stuff to sell! By the way, New blog candy, “studio G clear stamps, VS4911 Series 11, “thank you” and “widgets”, these are new dollar stamps I found at Michael’s, but they are darling and I thought I’d throw them in! I will also include one of these money holders, I’ll be posting other styles of these in future blogs, and (no, I’m not crazy — yet) There will be a $15.00 Michael’s gift card in one of these! Yupper, talk about candy! For these money holders, I used double sided Designer papers, stamped, and cut out, I embellished the sweaters with shrink plastic butterfly ‘pins’ the stamps are from the starving artist studio. There stamps can be viewed by clicking here. I have been stamping these onto transparencies as well, they are coming out so lovely! Exciting News! My dear Husband. (I need to take his picture so you can appreciate this guy). Got up with the youngest son, Chad this morning. I got to sleep until 7:45 am. You guys out there with kids can appreciate that that is ‘late’! Once up and dressed we went to our local nursery, and bought five cherry trees to replace those lost over time to underground cable, fios, etc. They will arrive tomorrow. Michael is out now with his shovel and baseball hat preparing the holes for these new trees! Oh if that isn’t enough, Chad made the Honor Roll! I’m now officially one of those dork parents with that ‘my kid is on the honor roll’ bumper stickers on my car. I am so proud of him! Remember feel free to ‘CASE’ my work at anytime, just be kind, don’t submitt it for publication and don’t sell stuff without asking. Isn’t this a fun stamp? I went to the Allentown Convention and spent my dollars! I love this stamp, The business card says this is the web address to buy them. I became frustrated with my mother a couple of days ago and after nearly 20 min on the phone (She is in Georgia, I am in Maryland) I started dumping my desk, lets just say it is clean. I did do some re-organizing as well. Now, its a mess again. I just can’t help but play with these stamps. They are a ‘plate’ of rubber and I used the EZ mount foam so I can use them with my acrylic blocks. I am looking forward to my step-daughter seeing these, she is very eclectic and I think she will adore them! Blog candy reminder, if you live outside the USA, you will be elijable for a card, I can no longer afford to ship things overseas. If you’re in the USA its not a problem. Once again I will put all names into a hat and draw one. For fun, I think my Chad (13 yr old with tude’) can help me out. I’ll post pictures for you guys to see. He is so tall, nearly 5’10” now. He is just growing way to fast! I hope you all are enjoying beautiful weather. Here in Maryland we actually had to turn on the Air Conditioner. Unfortunately, I can see every spec of dust in my house. its time for spring cleaning. I start with my closet, I was fortunate enough to have a little ‘me’ time and go out and buy some new spring/summer clothes. Too much fun! I am a bit spoiled! Happy Stamping, email me with any questions, and post those comments! Just a few words and some blog candy update! I know these clear sets are like $1.00 but i had some duplicates and thought, I’ll share these as blog candy. The other two stamps are from sparkle n sprinkle. I am officially no longer a member of their design team. There are many factors, none of which are ‘public’ business. So I hope you understand! (Not trying to be snotty or rude)! I am looking for more design work, so if you know someone needing a designer, hey hook me up! 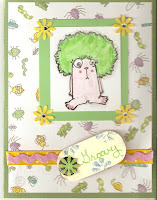 I am still waiting (starting to get impatient here) on my swiss dots cuttlebug embossing folder. I am fortunate enough to have a friend who owns this one so I can borrow hers for the time being.